PORTO SALVO, 22-Jan-2019 — /EPR Industrial News/ — Embracing the learning challenges of the new digital era is the main goal of the DIGIWELD project, which aims at providing digital tools for education and innovative practices for students from Vocational Education and Training Schools, as well as for welders who want to keep abreast of the new skills and competences required for new welding technologies. This project comes at a critical juncture, with the pace of change for businesses and the global economy accelerating and new digital and manufacturing technologies reshaping entire industries, a challenge to existing workforce qualifications, who have to adapt or risk obsolescence. To address these new requirements, broader access to education and training for skills development is fundamental, coupled with new, flexible learning options. Together, they are reshaping both traditional education and Vocational and Educational Training. A workforce able to cope with the new manufacturing and digital technologies becomes a driving force to competitiveness, since improved workforce skills triggers innovation and growth, move production up the value chain and are fundamental to shape the future labour market. Online learning platforms are one key asset to provide broad education to all those looking to improve their skills or gain new ones, and that is the unique position of DIGIWELD project, whose aim is to develop an open and innovative digital learning system (SIMTRANET) and education materials in welding technology. The benefits of this digital learning tool include reduced time and cost for industrial partners, a flexible learning tool for those looking to improve their existing skills, a better fit to the new generation of welding apprentices who are, by definition, digital natives, a set of new technologies and teaching methods for trainers and teachers and, finally, an improved education and training process, one that focuses both on apprentices need and employer’s requirements. Once fully developed, it is expected that new project will provide a unique insight to propose the transfer of innovation to the other 27 countries of the EWF network. As a result, it is expected that at least 5 new training courses will be provided to the market. The shift to a knowledge-based economy implies a workforce with higher skillsets. CEDEFOP – European Centre for the Development of Vocational Training – forecasts that the proportion of jobs in the EU requiring tertiary level qualifications will increase from 29% in 2010 to 34% in 2020. This comes in a context in which European education and training systems continue to fall short in providing the right skills for employability and are not working adequately with business or employers to bring the learning experience closer to the reality of the working environment. These skills mismatches are a growing concern for European industry’s competitiveness. 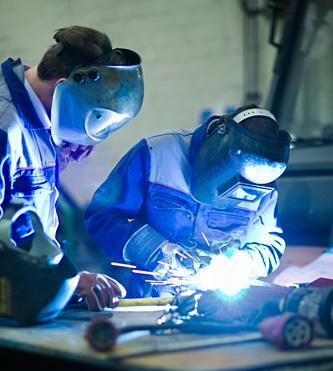 Welding is one such case, in that it is both highly technical on its execution and increasingly digital, but the number of Initial Vocational Education and Training apprentices, in spite of efforts to lure more young students, still fails to meet the expected business and industry requirements to ensure long-term needs. And work-based learning (e.g. apprenticeships in a real company environment) has not been as widely accepted by students and companies as expected, which means new and more enticing ways to use WBL need to be developed. Given the diversity of applications in industry, even students undergoing formal welding qualifications need to follow other study programmes to be qualified in specific procedures and then to pass an additional exam to be certified by a national/international body. These unique circumstances and environment were the driving force behind the creation of DIGIWELD project, whose consortium represents a strategic partnership between international education and training entities with the main goal to offer an adequate platform for acquiring and developing basic skills and key competences for apprentices, as well as for teachers/trainers in the field of welding and digital learning based on simulators. On the first part of the project, the 6 partners will develop the new system and training courses and seminars will be offered to the labour market. Once developed and approved by the EWF members, the curricula will become part of the Guideline and Italy, Romania, Portugal and Spain will become the core implementers of the new Guideline inside the 31 countries of EWF, with apprentices using the new training courses to become qualified welders at least in 3 countries. As a growing number of courses start being requested by the labour market, partners will continue their work dedicated to the improvement of the system. Once fully tested and implemented, it is expected that the system will become widely available to the remaining 27 countries of EWF and help the technical schools to build the training system for their apprentices. The DIGIWELD project brings together six organizations from Romania, Belgium, Spain and Italy. The consortium partners include ASR – Asociatia de Sudura din Romania; EWF – European Federation for Welding, Joining and Cutting; CESOL – Asociacion Espanola de Soldadura y Tecnologias de Union; IIS Progress s.r.l. – Istituto Italiano della Saldatura; Colegiul Tehnic “Domnul Tudor”; and ATS – Augmented Training Services, S.L. The project’s associated partners include the General Directorate of Training; University of Cracovia; Pronanomant Association; Astra Rail S.A.; ISIM Timisoara; Goierri Scola; University of Cadiz; Masa Huelva; Ministry of education of the Junta de Andalusia; Salesian educational community of Huelva; and lastly, the Directorate General for Social Assistance and Child Protection. DIGIWELD project has received funding from the European Union’s Erasmus+ (Strategic Partnerships for vocational education and training).